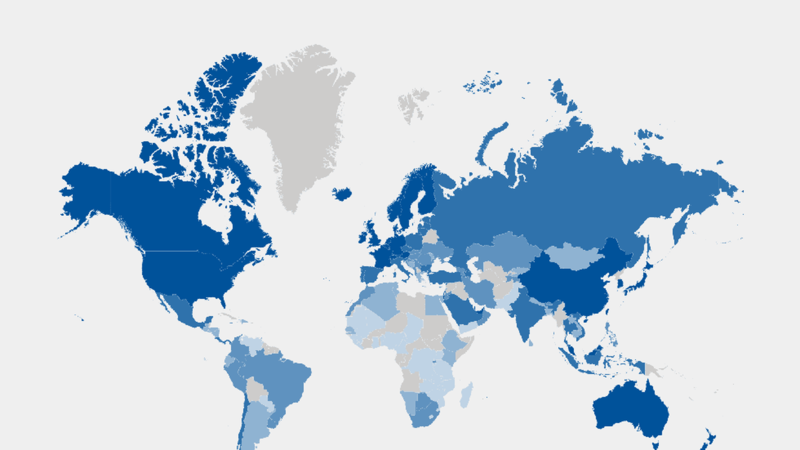 World Economic Forum map shows factors driving countries' productivity and prosperity, from best (darkest) to worst (lightest). Chart: WEF. "Ten years on from the global financial crisis, economies remain at risk from further shock and are ill-prepared for the next wave of innovation and automation," according to the "Global Competitiveness Report 2017-2018" from the World Economic Forum, best known for the Davos gathering. This chart bases competitiveness on 12 factors, ranging from primary education to infrastructure, and higher education to technological readiness. China is 27th. India is 40th, the most competitive country in South Asia. Go deeper: Scorecards for 137 economies.